Republished with permission from Ritualwell. The seven blessings are traditionally said during a wedding. This new version, by Rabbi Amber Powers for Ritualwell, was written with interfaith couples in mind. 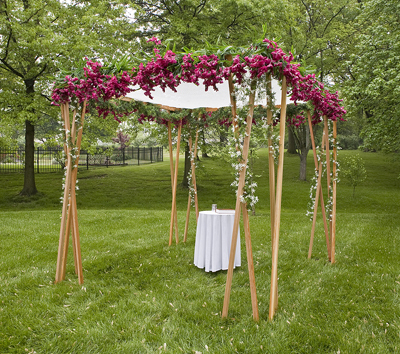 Customarily, the seven blessings (sheva brakhot) are said while the couple stands under a chuppah. 1. We acknowledge the Unity of all, expressing our appreciation for life’s sweetness. 2. We acknowledge the Unity of all, realizing that we are deeply interconnected. May you find comfort in your similarities and celebrate the qualities which make you different. May you be inspired each day by the abundance and diversity of the natural world. 3. We acknowledge the Unity of all, recognizing and appreciating the blessing of being human. All people have the capacity for love, generosity, kindness and compassion. May you express these qualities freely with each other and be blessed to receive them throughout your lives together. 4. May rejoicing resound throughout the world. May we envision a world in which persecution and oppression cease and all people and animals learn to live together in peace with each other and in harmony with their environment. 5. From the Source of all, we call forth an abundance of love to envelop this couple. May you be for each other true partners, companions and best friends. 6. We acknowledge the Unity of all, and we highlight today joy and gladness, bride and groom, delight and cheer, love and harmony. May we all witness the day when the dominant sounds through the world will be the sounds of happiness, laughter and celebration. 7. Blessed be this marriage. May the bride and groom rejoice together. Ritualwell is a unique website that offers traditional and innovative Jewish rituals for all occasions.